Coordinated Entry is the process by which an individual or family experiencing homelessness can be assessed for housing and priority of need at centralized locations, then participating housing programs receive referrals to openings in their housing programs, as they become available, from the Prioritization List. 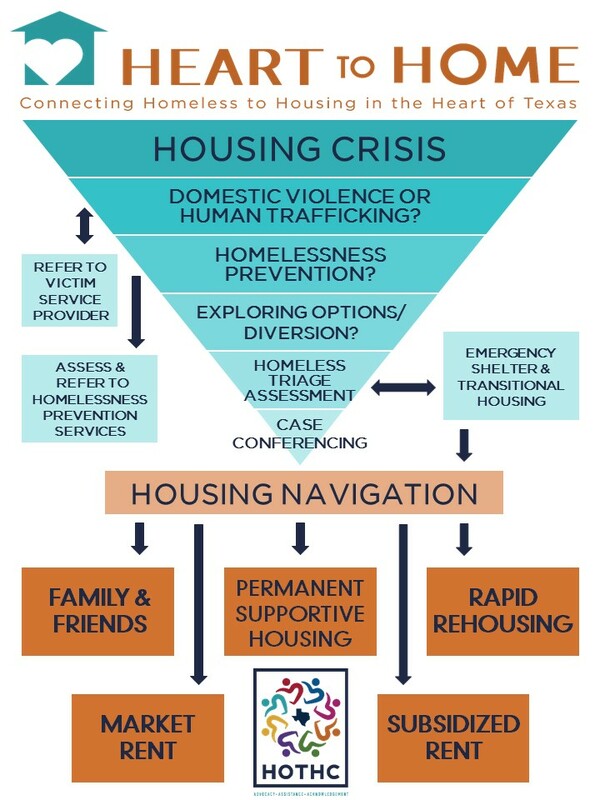 After being assessed, participants will be put on the Prioritization List and matched to openings in housing within the region in case conferencing conducted by the Coordinated Entry Committee of the Heart of Texas Homeless Coalition. Better outcomes for clients facing homelessness. Helps with minimizing the time that people experience a housing crisis. Helps with moving clients in and out of the homeless system quickly as possible allowing them to achieve housing stability. Allows each project to contribute to the common effort. At the Access Points, assessors will determine if the household being served would be best served through a Victim Service Provider, Homelessness Prevention Assessment and Services, Diversion Assistance, or Assessment for Housing. Assessor will obtain an HMIS Release of Information and Consent (or comparable document for Victim Service Providers). Assessor will conduct a Coordinated Entry Assessment, utilizing the VI-SPDAT as the triage tool, to screen households experiencing homelessness or at imminent risk of homelessness. After being assessed, participants will be put on the Prioritization List and matched to housing programs (as openings become available within the Continuum of Care region) through case conferencing conducted by the Coordinated Entry Committee. Participants will be contacted by the housing program if they are found eligible for entry into the housing program they were referred to via the Coordinated Entry process.